The American Society of Clinical Oncology (ASCO) annual meeting, a gathering of over 40,000 oncology specialists, was held this past weekend in Chicago. One of the studies that received a significant amount of press attention was the TAILORx study. There are several genomic tests which evaluate a tumor’s DNA to better determine how aggressive that tumor is, and how likely it is to recur without chemotherapy. The Oncotype Dx test was the first commercially available one. A sample of tumor is sent for analysis and the result is reported as a “score” which is then assigned to one of 3 categories – low, intermediate and high risk of recurrence. A sample of the report generated from the test is shown below. 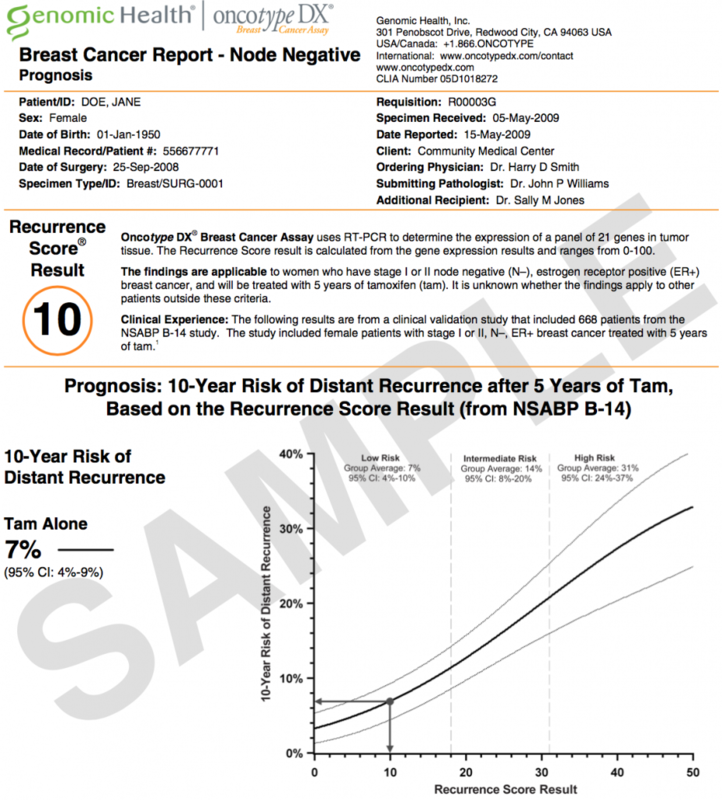 It is important to note that the Oncotype Dx test was validated in patients who received endocrine therapy, so the results assume treatment with tamoxifen or an aromatase inhibitor. It is appropriately used in patients with Stage I or II breast cancer, with spread to 1-3 underarm lymph nodes, if the tumors are estrogen receptor positive (ER+) and Her2/neu negative (Her2-). The results of the low risk cohort were published in 2015, which confirmed that patients with low scores receive little benefit from chemotherapy. The study presented at ASCO reported on the results of the intermediate risk group. For the purposes of the study, intermediate risk was defined as a score of 11-26. It is important to note that in patients outside of the study, intermediate risk is a score of 18-31. However, as patients in the lowest risk category did not receive chemotherapy as part of this study, the categories were shifted to the left to be more cautious. Patients enrolled in the study were women between the ages of 18-75, with a median age of 55-58. Eligibility criteria included patients who had tumors smaller than 5 cm, ER+, Her2-, and with negative underarm lymph nodes (as determined by surgical pathology – all patients in this study underwent surgery). Patients with an Oncotype Dx score of 11-26 (69% of the total study population, about 6700 patients) were then randomized to chemotherapy followed by endocrine therapy, or endocrine therapy alone. Median follow up was 7.5 years. The study showed that there was no significant difference in the overall survival (~94%), invasive cancer disease free survival (~84%) or distant disease free survival (~95%) between the 2 groups. However, in women under the age of 50, it was found that those with scores of 16-25 did receive some benefit from chemotherapy. It is unclear from the study if the benefit in these patients was specifically from the chemotherapy, or if it was that menstrual cycles and ovarian function are suppressed with chemotherapy, which then lowers estrogen levels. The authors raised the question of whether or not similar results in this group of patients could be achieved using medications to suppress the ovaries (which would induce menopause) and an aromatase inhibitor instead of chemotherapy. It is important to note that a low risk score does not mean the patient will not develop a recurrence or metastatic disease – it simply means that the risk of recurrence is extremely low and that chemotherapy will not significantly improve on that low risk. It is also important to keep in mind that this study did not include patients with triple negative or Her2/neu positive breast cancer, or patients where the cancer had spread to the lymph nodes. There are several commercially available genomic tests, and which test is used for a particular patient is often related to guideline recommendations and physician preference. Most of these tests are covered by insurance but the costs are high (~$4500.00) and patients should check with their insurance to determine if they have a share of cost. Most of the testing companies have payment assistance programs. For patients right on the edge of one of the risk categories, treatment decisions are not always as clear cut, and should be made in the context of the patient’s other disease factors and as part of a balanced discussion of the risks and benefits of treatment as well as patient preferences. There has been a lot of focus on de-escalaton of therapy, and rightly so. While chemotherapy and other toxic treatments have their place, there are significant short term and long term side effects, so determining which patients have the best likelihood of benefit from these treatments is important. Not all cancers will respond to chemotherapy, and in those cases, the patient is subjected to all of the harms and receives none of the benefit.